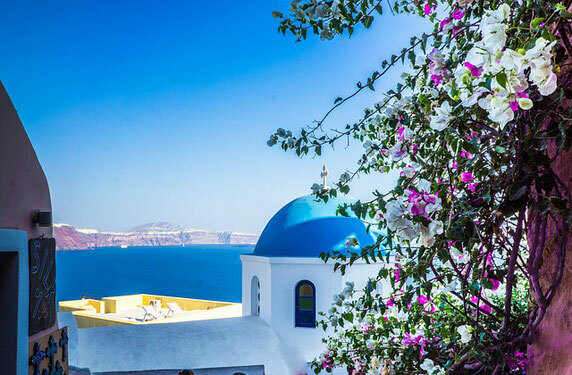 Rich in history, culture, good food and lots of beaches, the Greek islands are besieged every year by millions of tourists looking for sun, sea, good food and a holiday worthy of the name. 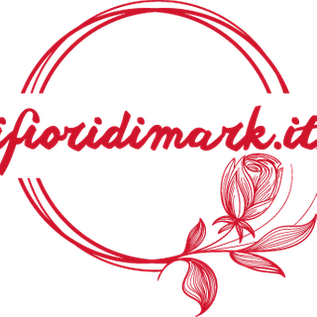 For us, which in addition to the long days of sea and sun, we also love exploring the territory in search of novelty, discovering a true open-air botanical garden was an immense joy. 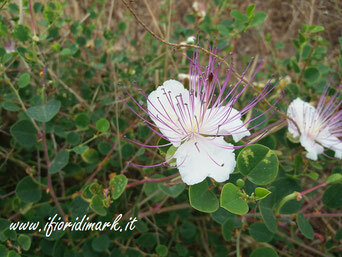 The common caper (capparis spinosa) is a typical plant of the Mediterranean areas and for this it will be easy to find it also in Southern Italy as well as in the South of Spain and some areas of North Africa. About 350 species belong to its genus. 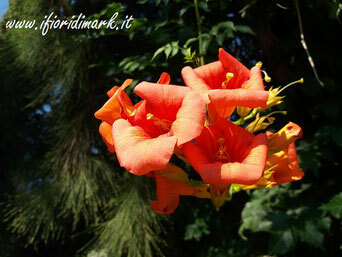 Campsis radicans belonging to the bignoniaceae family is a characteristic spring flower with a typical trumpet shape. Unlike the other "sighted" during our walks, this was located in the center a few steps from the sea, rather than in less inhabited hill areas. Hibiscus Rosa Sinensis: this hibiscus, of Chinese origin, is well suited to growing both in the garden and at home. 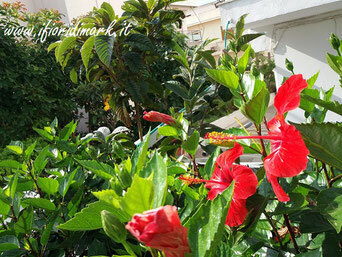 Traveling among the Greek islands you will discover different varieties of colors and species of the hibiscus that, we know, finds in this type of climate its ideal residence. 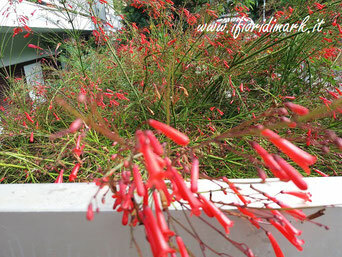 Russellia equisetiformis or the firecracker plant: when we talked about it in this article, we did not imagine it would happen in front of us after a few months. Instead here it is. 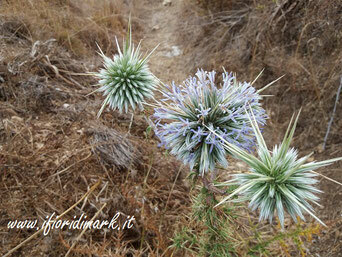 If you meet the crocodile thistle-bullet, pay attention to its thorns! We came across this plant in a completely abandoned area, so it's easy to think that it can grow without human help. Ipomea purpurea: not always visible even when you walk because it hides among the trees and its violet flowers can escape the sight of the passing bye. 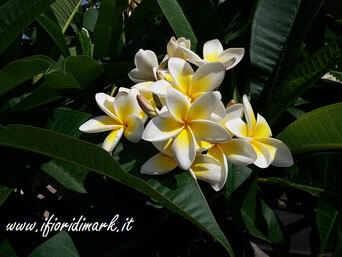 Plumeria Rubra: in Rhodes, for example, this flower is present in large quantities. You will never go under a tree, look out on a balcony or see something that does not have this flower from afar. The plumeria is really everywhere and fills the trees with its color. 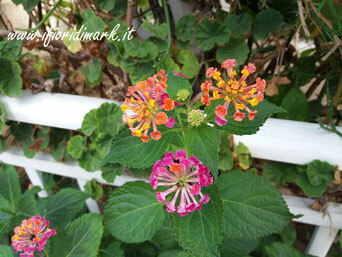 Lantana camara: colorful little flower, present mainly in Greek gardens. Easy to grow, it fills up every little space available throughout the summer. 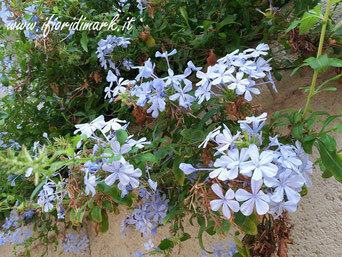 The plumbago is another flower typical of southern areas of Europe. 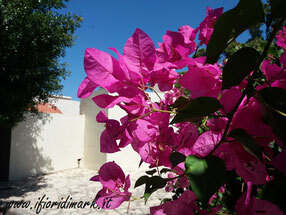 Thanks to its color is a very decorative plant and, if well pruned, able to become lush and productive over time. 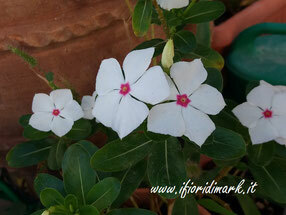 Catharanthus Roseus: Madagascar periwinkle. 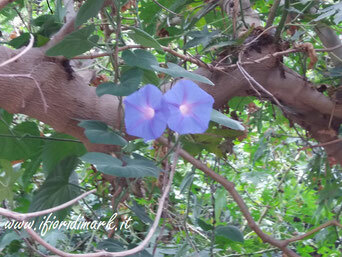 In some areas this flower grows wild and even in the mid-1900s it was used as a remedy for diabetes!